Why did Human Rights Watch select a former CIA official (Miguel Díaz) to sit on its advisory committee for eight years? 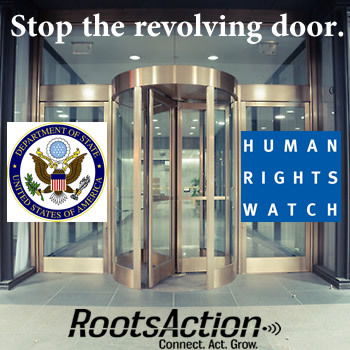 Human Rights Watch characterizes itself as an "independent, international organization" -- and yet its staff, board of directors and advisory committees boast deep ties to the highest levels of the U.S. government. Before becoming HRW's Washington advocacy director, for example, Tom Malinowski served as a special assistant to President Bill Clinton. Now he's President Obama's Assistant Secretary of State for Democracy, Human Rights and Labor. In 2009 he argued that "under limited circumstances" there was "a legitimate place" for CIA renditions -- the illegal practice of kidnapping and transferring terrorism suspects around the planet. In 2011 he wrote approvingly about Obama's unconstitutional NATO bombing campaign on Libya. The credibility of a global human-rights organization depends on its independence. Human Rights Watch has done important, critical work, but it can do better. It should implement at least a five-year "cooling-off" period before and after its associates move between HRW and the U.S. government's foreign-policy divisions. Human Rights Watch associates should concentrate on protecting human rights. They should not have conflicts of interest with past or future careers in branches of the U.S. government that may themselves be involved in human-rights violations. Please add your own comment if you are so inclined. We'll include them in the petition delivery. 15977 4.7 years ago John Jainchill Ashby, MA , US Im a regular contributor to HRW. But not if this is your relation with the government and you arent independent, and support, eg, any rendition. All fields indicated by a red asterisk (*) are required. By taking action you will be automatically signed up for action alerts from Roots Action. We consider your contact information to be private and confidential. We will NOT disclose it to any other entity unless you specifically authorize us to do so. You can unsubscribe at the bottom of any email you receive from us.